Pearsall, Texas, the home of the world’s largest peanut, is a small rural community sixty miles south of San Antonio. Primarily agricultural, the region attracts and employs Mexican-American migrant laborers, who work long hours in the hot Texas sun for low wages. Few of these migrants can either read or write; at best they are semiliterate. Although migrant families would like to remain in Pearsall for the full school term—late August through late May—many cannot. They come to Pearsall after school begins in the fall and leave before it closes in May, taking their children with them. Improving Self-Concept. We began in August, when our students—strangers to us and we to them—trickled into our classroom. We found them unable to perform many of the tasks we set before them. They reflected a host of negative attitudes and could not become good students unless they saw themselves as a community of learners. The format of our class needed to be revised. We began working together with our children on projects to raise their self-esteem and to give them a sense of unity. We traced each other’s silhouettes using an opaque projector. We measured each other’s armspans and heights and recorded our findings. We traced our hands and wrote some of our favorite things on each finger. We designed personalized covers for our first dialogue journals. Many of these activities were enjoyable art experiences. They encouraged cooperation and involved just the slightest amount of reading and writing. These activities had no wrong answers and thus contained no threat of failure. Each provided the opportunity for success, and the effect of a string of successes began to appear. Our students’ actions and language started to show signs of well-being. At the same time, we wanted our children to see us less as threats and more as facilitators. Therefore, for each activity we included ourselves in teams with the students. Our classroom became an incubator where self-esteem and cooperation were allowed to grow. Hooked on Books. We also read aloud to our students daily. Each day we read one or two of our favorite stories and afterwards, we discussed them. We began with easier, high-interest stories our children could relate to; gradually we increased the level of complexity and length. When we read a book, we wrote its title on construction paper and put it on the bulletin board. During the sixth week, each child picked one of the forty titles we had read and illustrated a scene from the story. Then using the illustration as a prop, the child told the story to the class. This oral language activity met with success. Our children had acquired knowledge, language, and confidence and were involved in a task that was not threatening. At the same time, and throughout the year, our children acquired story grammars which enabled them to predict the drift of the stories we continued to read to them (Carrell, 1983). The reading hour soon became a quiet hour around which the rest of our day revolved. In this way we planted and nurtured the seed of reading and it showed signs of germination early on. Our children began to ask permission to take home books we had read to them as well as paperbacks we had purchased for our class library. They elected a class librarian and on Fridays, we chose four or five of the new books and introduced them to the class by discussing the title, the author, and the dedication page. Then we would read the first few pages aloud. At a point of high interest we closed the book and asked if anyone wanted to take the book home over the weekend. There were always more hands than we could accommodate, and the ones we selected were looked upon with envy. Books assumed a new meaning and became valued commodities. Next, we introduced dialogue journals. The students wrote their journal entries on topics of their choice. We read the entries and responded within these guidelines: we neither criticized content nor did we edit. Most of our children accepted this way of writing to us and were eager to read what we had written. I like writing because we do art on it sometimes an I love writing and reading books because I love stories and I love draw in pictures alot because you can learn to draw pretty pictures and writing to other people and i halt writing what the teacher said to us to do because i like to write wat i like to do at my paper. You should keep a list of ideas about topics you want to write about. Keep it in your writing folder. Then when it’s time to write you’ll have plenty to write about. Why don’t you try writing on your own, without our telling you to write? The dialogue journals involved them with a real, responsive audience: us. By writing, we demonstrated the importance of writing in both their lives and our lives. 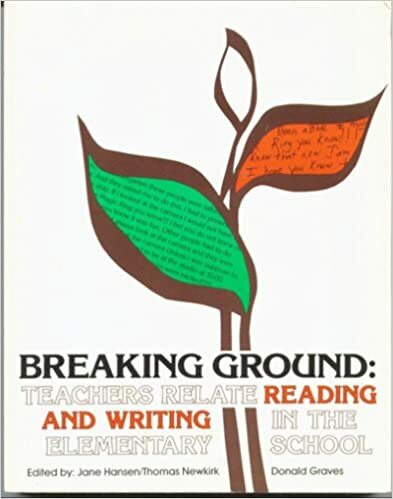 It is for this reason that Graves argues: “The writing teacher, like the pottery teacher, must practice the craft alongside the students.” And we continued to do so throughout the year. Our responses showed native speaker competence and provided accuracy in form and structure. Our children who were fluent, but not accurate, needed a model. We provided accurate spellings, structures, and forms. Jaime wrote one day that it was “harad” to hit a baseball. A portion of our response included the correct spelling of hard: “Why is it so hard,” we asked? Jaime spelled “hard” correctly in his answer. The dialogue journal also provided a reading lesson each day, a conversation between two readers who are also writers, each writing for the other, and each reading what the other has written.